Talk about a frightening taste of the future. People tend to have a fear of robots (which is perhaps why designers try so hard to make them look non-threatening), and they have a definite fear of spiders and snakes. So what happens when you mesh the two concepts? The military is about to find out. 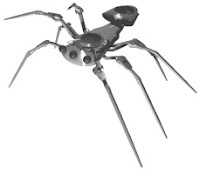 "BAE Systems is developing electronic spiders, insects, and snakes to help soldiers gather information without exposing them to dangerous situations on the battlefield, according an announcement the defense giant released this week. The effort is being funded by a $38 million agreement with the U.S. Army. The Micro Autonomous Systems and Technology (MAST) Collaborative Technology Alliance aims to create miniature robots that will act as the eyes and ears of soldiers in dangerous situations, such caves and mountainous areas, potentially saving many lives."